One morning, I openned the door to take our newspaper and immediately I was startled! This poor creature wanders the hallway of our condo unit. You can tell that it was so old and lost, LOL. It was really huge and we just left it there and in few minutes, it was gone. I thought they are slow? LOL! Here in Florida, anything can happen! 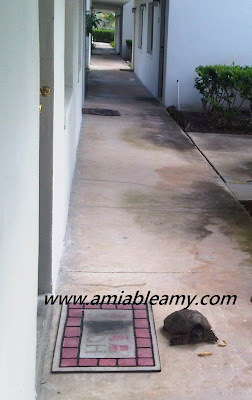 No matter where you live, you can always see animals wanders around. So far, I saw wild deer, big snakes and in pair, rabbits, squirrels, ducks and crocs along the highway. 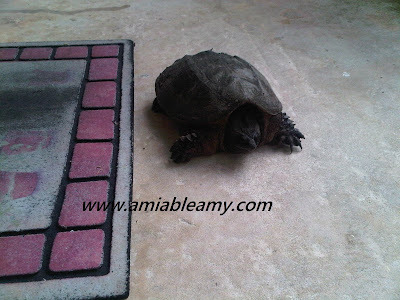 But, this is the first time that I have a close encounter of a snapping turtle in our unit. Usually, I saw them walking along the road and some were not lucky, they got run down by cars. 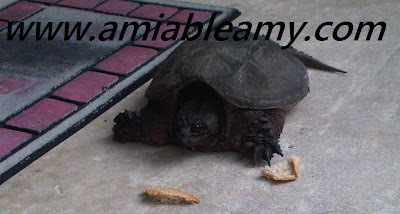 We tried to feed the snapping turtle and we left it there. As long as it is not a snake or a bear, I wouldn't mind the animals living around us. Well, I just wanted to let you know about my experience that almost gives me a heart attack! LOL!